Chalet Lapin Rouge is situated in Le Char Rond, a quiet cul de sac of luxury chalets on the Chavannes side of Les Gets. The chalet was built in 2000 and is modern and spacious with accommodation over 3 floors and sleeping for 8 people. 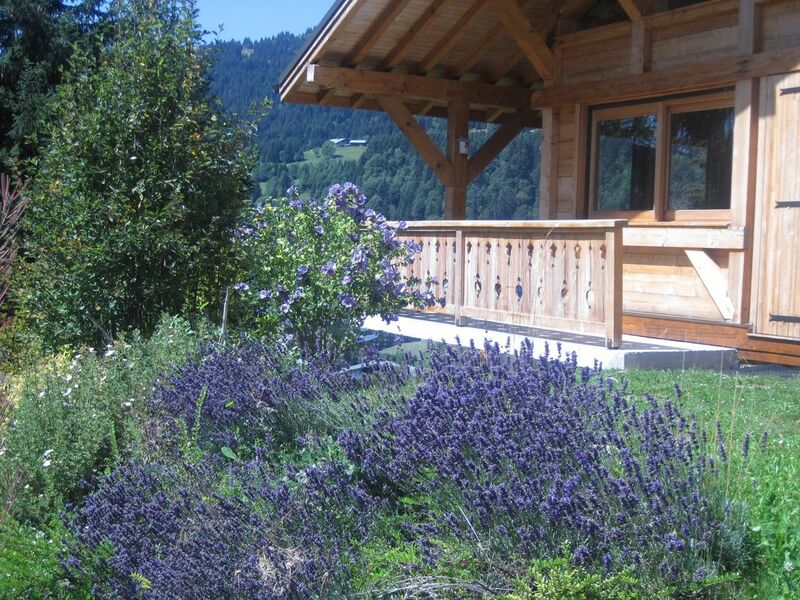 It has a large terrace with beautiful Alpine views over Les Gets. In most snow conditions, you can ski in/ski out of the chalet. You ski or walk approx. 100m to the end of the road and access a gentle slope down to the main chairlift and cable car. You can ski back to the chalet via a blue run. Additionally a free ski bus stops very close to the chalet. The location is also perfect for summer, being near Les Gets' swimming lake and adventure park and under 10 minutes walk, down across a meadow, to the village centre. Under floor heating on the ground and lower floors and convector heaters upstairs. Covered parking for 1 car, parking for a second car on the driveway. Additional parking available on the road. Heated room for boots and skis. Accommodation is spread over three floors. The open-plan living area on the ground floor is light and spacious and has separate kitchen, dining, lounge and office areas. The lounge has a log-burner and doors leading out to a terrace, with seating, which enjoys lovely Alpine views. There is a TV (with both French and English satellite TV), DVD player and selection of DVDs. The office area has a desk and free wifi internet access. The kitchen is modern and well equipped; the dining table seats 8. On the first floor are two bedrooms and a shower room. On the lower floor are two more bedrooms and a bathroom with shower. There is a heated room to store skis and boots as well as a large laundry room with washing machine and dryer. We also have secure bicycle storage. The ground and lower floors have underfloor heating whilst the first floor has convector heaters. A free high chair and cot are available. We subscribe to the Portes du Soleil Multipass scheme for summer activities. We had a great week at the Lapin Rouge. Charming chalet, perfectly situated and stunning views. We enjoyed every bit! We have been to Les Gets 3 times now and can recommend this as a really lovely family resort with a great range of skiing. The Chalet Lapin Rouge is a delightful Chalet with a really relaxed family feel in a perfect location for getting on the slopes quickly in the morning as it is by Le Lac in Les Gets. There is a very short walk down the little street to the piste and then a relaxing blue run down to the Chavannes Chair/Cabine and ESF ski school. We loved having the ability to ski home in the late afternoon and this seems to be quite a rare find in Les Gets. We will definitely be returning! The Chalet has a lovely open plan dining/kitchen/sitting room area with beautiful views. The bedrooms are all of a good size and the beds comfortable. There is a useful place to put boots and skis downstairs as well as a good sized hall area with hooks for coats etc. at the front door. We were self catering and the kitchen had all the utensils that you need. A little tip for other guests - don't assume that there will be any salt/pepper/oil/sugar/cafetiere filters etc. the guests before us didn't even leave any kindling (which is something the owner does ask the guest that is leaving to do) so its a good idea to come well stocked. We had a fabulous week and would love to return next year. Great place to stay for two families of four, accommodation is well thought out and the ski in/out location was fantastic for getting to the Chavanne lifts. Only a ten minute walk from the town centre, less if you use the slopes. We enjoyed skiing back in the afternoon with a stop off at the lake for a play at the park and a well earned drink at the bar. Would highly recommend. Les Gets is a lovely town and has everything you need as well as good Après Ski and entertainment. All within walking distance. Great for kids and adults. Dealing with the owners was a delight - they could not have been more helpful including making some useful recommendations on ski hire, restaurants, best slopes and rest stops etc. Broadband and desk to plug in the laptop was an added bonus along with satellite TV and DVD collection. We had a wonderful time there and despite it being the very end of the ski season the snow was good enough to the end. Our kids loved playing around the lake after skiing and want to come back for the summer to go on the big slide and adventure park. We will definitely be back! The property was accurately described on the website. Booking was easy; excellent customer service from both the owner and Mountain Xtra. We ordered a welcome pack (silver) of goodies from Mountain Xtra which was all laid out for us and most welcome as the shops were shut by the time we got there. We think Chalet Lapin Rouge is very well equipped and very comfortable and in a really good location. Being April and near the end of the season there wasn’t enough snow to ski in/ski out, but it certainly didn’t take long to get to the town and ski lifts – a lot longer getting back with shopping to carry so we used the free, half-hourly bus. We made use of the wood burning stove several times. It snowed the night before we left and everywhere looked very pretty. Would recommend staying here. Some of us hired ski equipment from Berthet Sports which worked well and it was great to be able to store skis at their shop in town; others used Doorstep Skis which was a really good service too. We self-catered and found the Carrefour to be well stocked. We ate out at the Creperie and Le Tyrol in town, excellent food and service in both. We found Le Yeti good value for lunch when skiing and ate there most days. Les Gets is an attractive village of traditional chalets, near Morzine and Avoriaz, just one hour from Geneva airport. It has an excellent snow record and good French and English ski schools which makes it a very popular destination for families. It is part of the vast Portes du Soleil ski area, which straddles France and Switzerland, although the extensive local area of Morzine/Les Gets will satisfy most people.The village has a mainly pedestrianised centre and a good range of shops, including two small supermarkets; a wide variety of restaurants; a few bars and a nightclub. There is an outdoor ice rink, which adds to the charm. In the summer, there is a swimming lake with man-made beach; adventure park; 18-hole golf course and extensive mountain bike and walking trails. White water rafting is available nearby. Within easy reach for day trips are Annecy, Evian, Chamonix, Geneva and the beaches on Lake Geneva. • Bed linen and towels included. • Tourist taxes included. • End of stay cleaning included. • Free cot and high chair provided. • Signed rental contract and 25% deposit required to secure the booking. Balance due 6 weeks before arrival. • We use a local company, Mountain Xtra, to clean and look after the chalet. They also provide a range of guest services (www.mountainxtra.com).